The Steps for Students 5K is an annual Archdiocesan-wide event that raises awareness of Catholic education and provides much-needed funds for our Catholic Schools. We are excited once again to participate in Steps for Students. This year's race is on February 16, 2019. Our goal is to have all students along with their families register to run, walk, or snooze by January 31. Please visit https://steps4students.org/ to sign up. All students who register will earn a free dress day as well as a Steps for Students t-shirt. Lisieux House will oversee our tent in the Catholic School Village on race day. We plan to offer free face painting provided by students in the National Art Honors Society. If you are interested in donating snacks, giveaways, or covering the cost of face painting supplies, please contact Elizabeth Dronet at edronet@sj23lions.org. 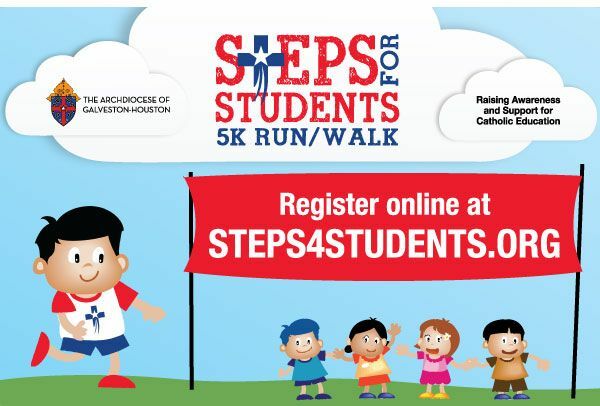 Steps for Students is an opportunity for all members of the faith community to work together to support education of mind, heart, and spirit in the many Catholic Schools of the Archdiocese of Galveston-Houston.